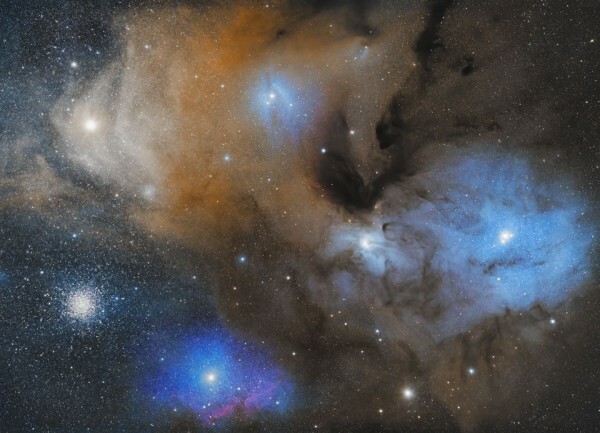 Dust clouds Rho Ophiuchi in the constellation Ophiuchus are one of the closest to Earth. That is, knowingly and if you see the picture, you will see that is a creative zone stars, well, it is closest to Earth. The colors are not due to observe if the density and gravity of the gas, let that although it is condensed to form new stars but the reflection of starlight around. Through infrared light it is when and where you can see the stars being created inside. Remember that the blue colors are the most energetic, yellow if they are areas of hot gases (around 0 degrees Celsius’ Remember that space is at -270 degrees centigrade), the brown and black areas are dust absorbs light ( brown areas not all light, while all black). Gas and cosmic dust is a dual element, creator of stars and blocking light. The infrared spectrum is very important to see what’s behind it.